He should change his name to Sid Slaughtergraaf because he kills everything he rides. 1:11 dude tips his hat to the camera mid-whip... Raw style! lol. dude. are you serious?! Haha I was only kidding with the last comment but I already knew Pinkbiker's have zero sense of humor so the neg props are inevitable, might as well have some fun on my part. Video still gets me amped! Gotta visit this bike park someday.. When he bikes out of the smoke..... simply bikegasmic. 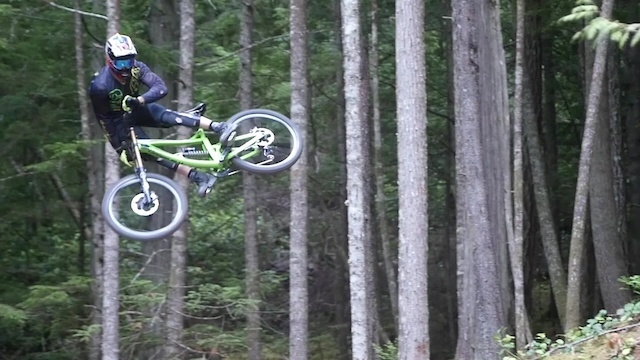 best coast gravity vid ive seen yet, sick edit boys. If you have spent the last few years racing in Ontario you will who of Sid for sure.Not just a dual suspension cowboy,this guy can ride slopestyle as well.He has double flips in his bag of tricks and almost won best trick at the Teva Mountain games in New Zealand two years ago. Oh..and he is a carded WC racer as well.Good on Dunbar Cycles for supporting him but he is worthy of a shot on a factory team. Maybe if I get a transition I can once fulfill my dream of having style. Bas, Sid and Dean all have the sickest styles and they ride Transitions. Hey RedBull.... Give Sid a call, you will not be disappointed!!! Only thankful!!! Anyone have an idea or know how tall Sid is and what size of frame TR500 he's riding? The reach numbers make me think only the large or X-Large would be a good fit and I'm only 5'8. if i didn't feel inadequate enough... that will do it. awesome riding. great edit. good tunes. Well i think transition have won the world wide argument of steeziest bike company with this guy added to their team of riders! UGH! I wanna shred that park soooo bad. I love the whip into the camera! Ha! C'mon Transition, sponsor this guy! The Covert edit convinced me to buy one and now I want a TR500.. I'd love to see Sid and Transition racing WC! one day i will be lucky to ride here. coastal crew build a trail in my town! what camera is used to shoot this? yes it is a cool video, but way to much slooow motion. Unfortunately Sid is too fast for the camera, if it was regular speed you wouldn't be able to see him. so stylish my god.. island living. they did such a nice job on that park. So sick!!! Wish it was longer! sickest video out there. gets me pumped to ride! VOD, VOD,VOD!!!!!!!!!!!!!!!! Chant it with me! Dude is slothegrafing down there with steez. Fabulous. After big bike tricking arrived, lots of my bmx chums were like 'it's all about what you're used to'... having chirped on for years about how bmxs were the best bikes for tricks. 'So it's harder on a bigger bike?' I said. Apparently not. I imagine they suddenly felt under threat. Anybody know what helmet he has? The one-hand whip is the sickessssst ever ! sickest edit i have ever seen! When is the next video coming?! he hit the camera at 1:32ish, right? oh and -- sweet bike... too bad they sold out for the season already. damn, sid can ride! I met him one time in ontario at inflow. he had a lot of flow and was a nice guy to top it off. totally didnt know he rode DH like that. also that trail looks amazing! I will visit this park.